It's a slimmer profile, but is the Air much of an upgrade? If your iPad seems a bit porky next to, say, the 7mm thin Sony Xperia Z tablet, fear not: Apple has taken the knife to the iPad Air and slimmed it down considerably compared to the third and fourth generation of its tablets. The iPad Air is 7.4mm thin, 170mm wide and 239mm tall. Last year’s iPad measures 9.4mm by 186mm by 241mm in comparison. While a few millimetres less in each dimension may not seem like such a big deal, the size shrink is noticeable, but the weight loss is arguably the main attraction. 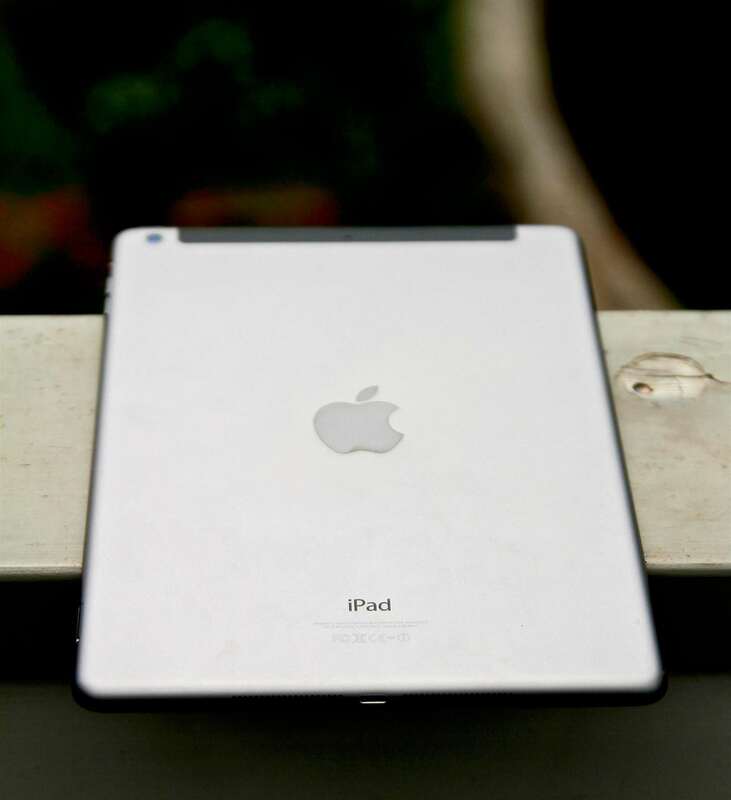 Our review sample, the w-fi plus LTE iPad Air with 128GB storage weighs a mere 478 gram. That’s 182 gram less than an equivalent iPad 4th gen tablet and with the reduced dimensions, the lower weight makes for a more comfortable device to hold and a nicer design overall. As we'd come to expect from Apple, the build quality of the iPad Air is excellent. The aluminium body has no sharp edges, and the tablet is precision-made in every respect, even down to the new Apple smart case and smart cover accessories which fit snugly and securely with no gaps. If slimming down the iPad and adding the Air moniker to the device was all Apple did, it would make for a somewhat weak reason to upgrade, especially since the 4th gen model offers the same ten-hour battery life, 2048 x 1536 pixel screen resolution and 128GB maximum storage. Speaking of storage, the jump in price for additional memory capacity is steep: another $100 buys the 32 gigabyte model, up from 16GB; paying a further $100 gets the 64GB, with the 128GB iPad air costing $899 for the wi-fi only version. Per gigabyte, that’s $37.38, $21.85, $12.48 and $7.02 respectively. The wi-fi plus LTE broadband versions of the iPad Air follow a similar pricing pattern, which grates given that flash storage isn’t expensive for manufacturers. Under the hood, the hardware has received a serious upgrade. The iPad Air sports the same new and fast Apple A7 dual-core processor with an M7 motion co-processor as the iPhone 5s. Other new hardware in the iPad Air include better, backside illuminated front and rear-facing FaceTime HD and iSight cameras, with 1.2 and 5 megapixel resolution respectively. The rear camera is adequate, but not a patch on the iPhone 5s 8 megapixel camera. It misses out on fun features such as 120 frames per second shooting, too, which is a pity. While we didn’t pull the loaner iPad Air apart, those at iFixit did. Inside, they found a smaller 3.7 volt 32.9 Watt-hour two-cell battery than the three-cell 43Wh one in the iPad 4th gen. The smaller battery likely accounts for much of the weight loss between the new and old iPad. But as the A7/M7 combo uses less power, battery life remains the same. The ten hour claim by Apple holds true, and if you don't use the iPad constantly, it's possible to go over two days between charges as the standby mode is very power efficient. Ifixit also discovered an LG-made touch panel in the iPad Air, which Apple says is a fifth less thick than the one in the previous tablet. The retina panel is very good, with 264 pixels per inch, wide viewing angles, vivid colours and sharp contrast. That the display is better than the past generation is borne out by testing carried out by DisplayMate’s Dr Ray Sonera, who says screen parameters such as reflectance, contrast, peak brightness and colour accuracy are improved compared to the 4th gen iPad. What’s more, Sonera found that the iPad Air display uses 57 percent less power than the screen in the 4th gen iPad. This means it heats up much less, making the iPad Air more comfortable to hold over longer periods of time. The lowered power consumption led Sonera to speculate that Apple is using IGZO or indium gallium zinc oxide transistor backplanes for the iPad Airs, but this hasn’t been confirmed. It’s not just the viewing that’s great on the iPad Air: the digitiser on the display responds really well to touch, so much so that this reviewer could almost touch type with all ten fingers. LTE mobile broadband covers more frequency ranges in the iPad Air for better roaming (providers permitting) which is great. However, LTE support is still only at Category 3 and not 4, so you won’t get the 150 megabit per second downloads and 50Mbps uploads that some competing devices provide. Just like the iPhone 5s, the most noticeable thing about the new iPad is that it’s a good deal faster than the earlier hardware, which wasn’t slow to start with. The 64-bit processor makes light work of iOS apps, which start up fast with quick task-switching as well, despite the mere 1GB of system RAM available to them. Most of the bundled system apps are now 64-bit instead of 32-bit and on the new hardware, are considerably more responsive. High definition videos run stutter-free on the iPad Air and from a performance standpoint, there’s nothing to complain about. Geekbench 3 rates the iPad Air at 1459 for single-core and 2615 for multi-core performance which is a tiny bit higher than the iPhone 5s with which the new tablet shares its processing hardware, despite the screen resolution being higher. However, the iPad Air isn’t the same as the iPhone 5s in every way. If you do have an iPhone 5s (see our review of it and the 5c), you’ll soon find the lack of TouchID finger print sensor annoying. Having to tap in a pass code or password each time the device has gone to sleep is just so five minutes ago after you get used to simply putting your finger on the TouchID sensor. Given that most of the hardware in the iPhone 5s and iPad Air are the same, it’s a real shame Apple decided to not include the TouchID sensor in its top of the range tablet, because it deserves it. A little disappointing too is the lack of 802.11ac 5GHz high-speed wi-fi in the iPad Air, which would provide close to wired Ethernet network speeds and which is built into the new iMacs. The 802.11n wi-fi with multiple in and out (MIMO) antennae is nevertheless very quick, and likely faster than most broadband connections. It was certainly able to keep up with a 44/10Mbps VDSL2 service. As an aside, if you do get an iPad Air, make sure you update to the latest version of iOS. Before iOS 7.0.4, the operating system in the iPad was somewhat flaky and crashed a couple of times. The toughest competition for iPad Air will most likely be from Apple itself: the iPad Mini retina trades off some physical screen estate for even better portability through the smaller size and lighter weight - and it comes at a lower price. If you’re in the iOS ecosphere already and looking to upgrade from earlier hardware, the iPad Air is a great choice. It's faster, looks heaps better and the lighter weight makes it more comfortable to operate. Get a keyboard case, and thanks to the quick performance, long battery life and Apple's bundled productivity apps, the iPad Air is probably all that many people need as a portable computing solution. That said, the iPad Mini with a retina display is arguably better value for money in a more compact package weighing even less than the iPad Air.